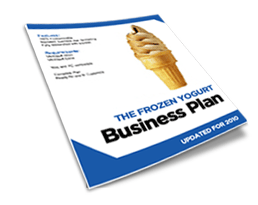 The Frozen Yogurt Business Plan is a great business plan template for anyone looking to start a frozen yogurt business. Are you struggling with how to write your business plan, what to include, and how to calculate financial information? This business plan will outline everything you need to write a thorough plan whether you are looking to open a new shop or expand your business. It is extremely important for any business owner to have a detailed business plan before starting a new business. This helps entrepreneurs plan how they will run the business, if it will be profitable, and what they will do to ensure success. Frozen yogurt is a very popular dessert as it is a healthier frozen dessert. Many frozen yogurt shops are found in shopping centers and near restaurants or movie theaters because it is often an impulse buy.